You can access your ToC from any computer that has an internet connection. Users can create, share and use Theories of Change in a secure environment. Provides the ability to produce versions of theories appropriate for different audiences, such as boards, funders, constituents, partners or decision-makers. TOCO makes it possible to view, compare, and edit the many layers of a theory intuitively and efficiently. Set permissions of different members for different TOCs, share ToC files. Stores the elements of a ToC: indicators, outcome definitions, interventions, rationales, etc. Easily exported in editable spreadsheet (Excel compatible) format. Unlike Visio and many other flow chart programs, TOCO is explicitly designed for theory of change and therefore allows you to develop not only the outcome pathway but use the rationales, indicators, and interventions features interactively to strengthen and corroborate the evolving logic of the pathway. TOCO is not just a drawing program but a database that stores information on all the components of a ToC. Everything in one place: With TOCO there's no need to purchase and learn cumbersome drawing programs. Easy collaboration: TOCO for Teams provides users with the ability to invite partners and stakeholders to log on, open up a particular theory, and make comments. 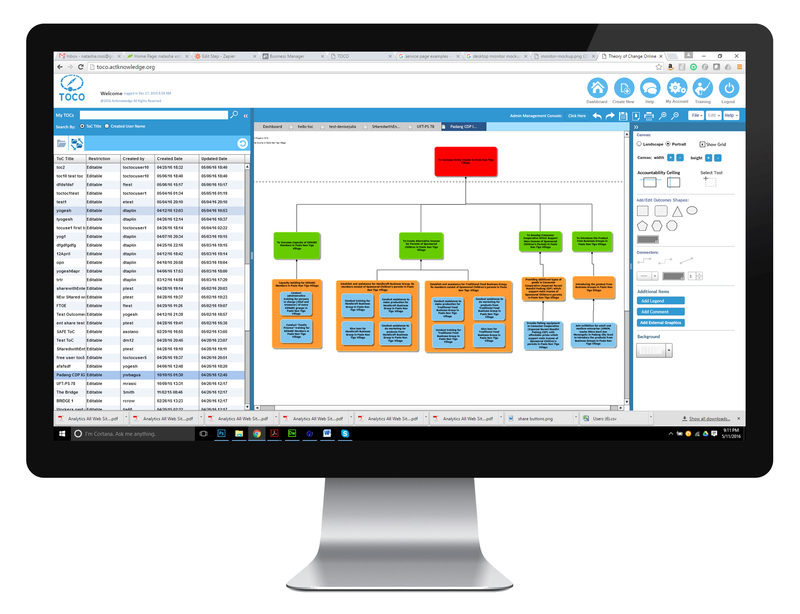 Cost-effective M&E tool for consultants and organizations. Designed for government and non-government organizations, businesses, etc. Since TOCO is web based, cache & cookies on your browsers can cause the software to slow down or crash. Please clear cache and cookies from your browsers history. Internet Explorer browser is not optimized for TOCO Software. Please use Firefox, Chrome or Safari to load TOCO. If you can't open certain files within TOCO or certain features does not work properly please refresh your web page. Most issues can be resolved by refreshing the page. (Make sure to safe open files before refreshing). TOCO data export features generates a zip file which some computers need an Unzipper software to open the file. TOCO is a web based software therefore we recommend using a landline or having access to a strong wifi connection. TOCO is a FLEX based application that needs Adobe Flash to run. please make sure you have the latest version of flash. Legacy users, please make sure that you have cleared your cache and refreshed. New TOCO 2.0 has a copyright date of 2017. You will get an automatic error if trying to use legacy TOCO. Need us to resend your activation email?